In this article I cover how you can fix the Base SDK Missing problem you might have had using the iOS SDK 5.2. The video above is easiest to see in full screen mode. I got one of my books on iPhone programming from Amazon.com. 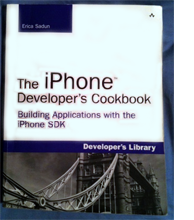 The iPhone Developer’s Cookbook by Erica Sadun. It’s been about two days now. I’ve been pouring over it at home and riding the train to and from work. I am finding it helpful. Will I realize my dream of getting an app in the iPhone App Store?